GE’s The Boy Who Beeps commercial has been awarded with the Grand Prix for Film at the Epica Awards. The commercial tells the story of a boy who is born with the ability to talk to machines. His conversation with technology evolves from moving his toys around and changing the television channel to communicating with the electrical grid, traffic light, aviation and medical systems. 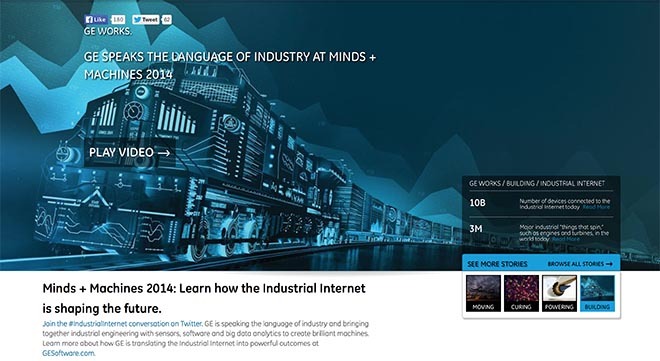 Launched in early September 2014, the cinema and television advertising campaign promotes GE’s commitment to industrial internet. Unlike the boy, the Industrial Internet is real. It could soon link billions of machines and devices ranging from smartphones and thermostats to jet engines and medical scanners. GE believes the network could add $10 and $15 trillion – the size of today’s U.S. economy – to global GDP over the next 20 years. The company’s software arm has developed a software platform called Predix that allows railroads, oil drilling companies, wind farms, hospitals and other customers to perform prognostics on machines, reduce downtime and increase efficiency. The “Boy Who Beeps” was the first in GE’s Industrial Internet Stories series, with an #IndustrialInternet conversation on Twitter. Films include “Thrillingly Predictable: The Chase”. The Boy Who Beeps campaign was developed at BBDO New York by chief creative officers David Lubars and Greg Hahn, executive creative director Michael Aimette, creative director/copywriter Tim Roan, art director Lance Vining, director of integrated production David Rolfe, executive producer Diane Hill, agency producer George Sholley, junior producer Sasha White, head of music production Rani Vaz, executive music producer John Melillo, account team Brandon Fowler, Peter McCallum and Tessa Cosenza, head of planning Jeff Kenyon. Filming was shot by director Lance Acord via Park Pictures with producers Jackie Kelman Bisbee, MaryAnn Marino and Caroline Kousidonis. Editor was Kirk Baxter at Exile with assistant editor Nate Gross and producer CL Weaver. Visual effects were produced at A52 by VFX supervisor Patrick Murphy, CG supervisor Andy Wilkoff and producer Scott Boyajan. Sound was designed at Barking Owl and mixed at Lime Studios by Zac Fisher. Music is “Cycle” and “Morning” performed by Beck from the album “Morning Phase”.